“East Meets West” is a wonderful theme; an artist in any field can explore it happily again and again. 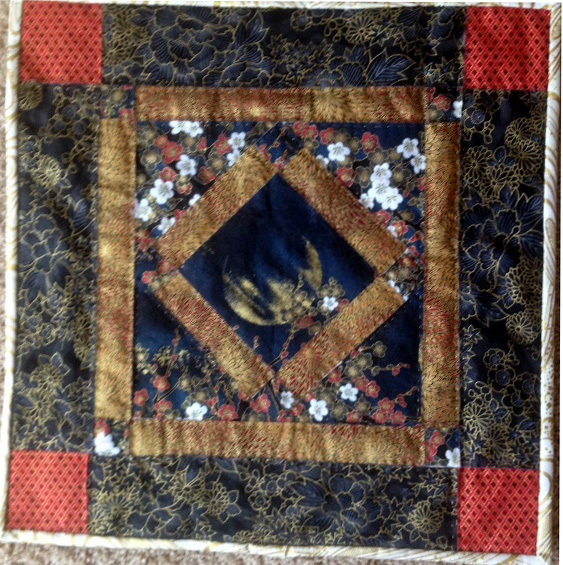 For this challenge I’ve chosen to juxtapose a Western motif (in this case, an Amish block design) with Eastern fabrics. The Amish are known for their simple geometric blocks and for using deep tones, as I’ve done here, although the fabrics I’ve chosen – patterned, gridded, pictorial – would have had no place in their quilts. But that’s what I like – the unexpected pairing of elements, which produces its own complexity. Your different approach produced a nice “Amish” block. I like the mixture of fabrics you have used, to produce a very effective block. A nice approach to use Japanese fabrics for an Amish block. Good combination of two different worlds. I think both the Amish and the Japanese will agree with your interpretation of the challenge. Susan, I like your ideas behind this quilt which portrays the theme perfectly. Lovely use of the subtle fabrics and stitching.